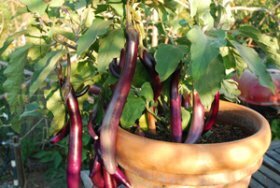 Choosing the right containers for container gardening is just as important as selecting the potting soil and picking the right vegetable varieties. Personal style often dictates the types of containers you choose, but there are other considerations as well. The size, shape, color, and material affect how water moves in the pot and how hot the pot gets. 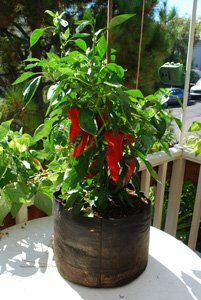 The temperature of the pot, in turn, affects how often you have to water, and how fast nutrients cycle in the container garden soil. Space and weight considerations are also important in choosing containers for container vegetable gardens. Choose containers for container gardening that are large enough to accommodate the vegetables you’re planning to grow in them. Container Gardening Vegetables helps with matching vegetable root depth to container size, and includes recommended vegetable varieties that perform well in each container depth. 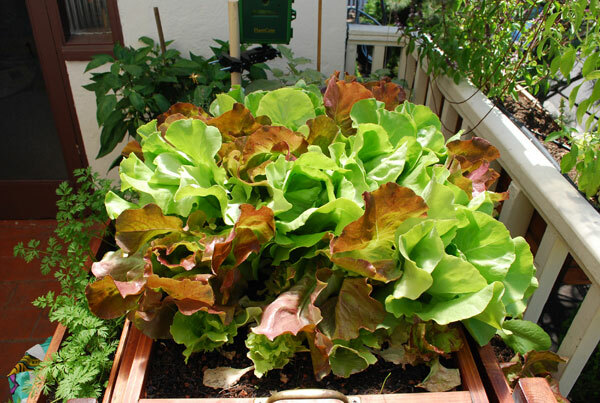 Leafy greens can grow in a very shallow root zone—as little as 3-4” (7-10cm). See salad tables for ways to grow salads in shallow trays. Spinach and leafy Asian greens can be grown in shallow trays as well, but you’ll get a better yield planting them in a container with a 6-8” (15-20cm) root zone. Herbs, broccoli raab, and larger Asian greens need 10-12” (25-30cm) of potting soil. Fruiting plants like tomatoes and peppers need an even larger root zone. Usually a 5-gallon (27cm) pot is the minimum size for fruiting plants like these, and that’s with a great potting mix. 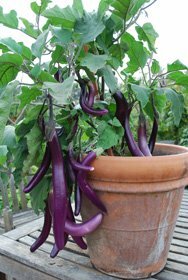 7-gallon (35cm) pots are ideal for peppers, chiles, eggplants, and bush tomatoes, but indeterminate (vining) tomatoes and squash do better in 10-15-gallon (47-75cm) pots. For larger varieties of vegetables, cantaloupe, or winter squash, 18-24” (45-60cm) of potting soil is best. Large containers hold more soil. The larger the soil volume, the stronger and more resilient your plants will be, and the less frequently you’ll have to water them. Yes, you can grow Genovese basil in an 8” (20cm) pot, but it won’t grow as large or luxuriously as it would in a larger container, and it will dry out much more quickly. Herbs in little pots may look cute, but I’m not a fan of small containers. Herbs and vegetables grown in small containers are just too vulnerable. A moment’s inattention or a delay in getting home to water can kill them. A rule of thumb for choosing containers for container gardening: Square, rectangular, or cylindrical containers need less frequent watering than tapered pots. Tapered pots have more soil at the top of the pot, where it dries out quickly. Square, rectangular, or cylindrical containers have more soil volume in the lower half of the container, where it retains moisture better. In essence, the top 6” (15cm) of soil acts as a mulch for the soil below, holding in moisture. Vegetables grown in straight-sided containers also tend to have healthier, more vigorous root systems. Plant roots generally follow water downward, instead of running laterally along the surface—especially when the surface dries out frequently, as it does in container vegetable gardens. In selecting containers for container gardening, bear in mind that the top 2” (5cm) of potting soil is often wasted. The main plant roots usually start 2-3” (5-8cm) down into the soil. This “wasted” soil volume is higher in pots that fan outward toward the top than it is in straight-sided pots or window boxes. 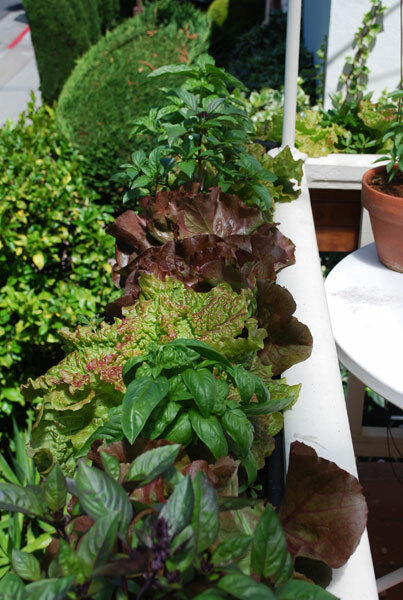 Apartment balconies and decks are living spaces, so when growing vegetables in containers, choose planters whose size, shape, and color fits the space you’re trying to create. Color affects heat and moisture in container vegetable gardens. In general, lighter colors reflect light, and keep things cooler and moister. Darker colors absorb and hold heat, so plants dry out more quickly. In the spring and fall when the light is slanting, darker pots will be warmer, and more hospitable to heat-loving plants. As a general rule, solid container colors are better than patterned containers. The foliage, stalks, flowers, and fruit of your container garden provide plenty of variation in form and color, and it’s better anchored in a solid color base. That said, your taste dictates the color and form of your container garden, so if you find a pot with a busy pattern that speaks to you, buy it—you can always find a plant that will fit, and balance it out. Do you want a calm, serene place, to sit and contemplate the foliage? Choose wooden or terra-cotta containers with neutral colors. Want a bright, cheerful place? 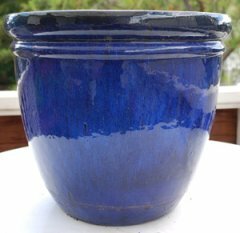 Choose glazed pots in vibrant colors that delight the eye. Containers for container gardening can be made from wood, clay, glass, plastic, concrete, or metal. Any vessel that allows excess water to drain through and doesn’t leach toxins into the soil will work, but each material has advantages and disadvantages. Wooden planter boxes are among the best choices for growing vegetables in containers. They’re attractive, they come in all sizes, and they’re durable, widely available, and relatively cheap. Wood doesn’t heat up as much as plastic or ceramic pots, so wooden planters work well on hot balconies or decks. They’re heavier than plastic, but lighter than ceramics. Their rectangular or square shape also helps retain soil moisture. Vegetables grown in wooden planters are often healthier than vegetables grown in pots of the same depth. Their roots stay cooler and have room to spread through the whole box, even if they’re competing with other plants. The biggest advantage of wooden planter boxes and half-barrels—their large soil volume—is also their biggest disadvantage. Wooden planter boxes range from 4” (10cm) deep to a whopping 24” (60cm) deep. Four-inch (10cm)-deep boxes aren’t much better than shallow pots—they dry out way too quickly. Don’t buy a window box that’s shallower than 6” (15cm). Salads and green leafy vegetables thrive in an 8-12” (20-30cm) deep planter box, but 12” (30cm) is the minimum size for bush varieties of tomatoes, green beans, peppers, chilies, and cucumbers, and for large herbs like basil and oregano. Half Barrels from wine or whiskey production are often available from garden centers. These large vessels are an excellent choice for growing vegetables in containers. Tomatoes, green beans, peppers, squash, cantaloupe, and cucumbers grow well in the ample root zone of a half barrel. The downside of wooden planter boxes and half barrels is their bulk and weight. They take up a lot of space on balconies and decks, and can weigh upwards of 250 lbs (113kg) when filled with potting soil and plants. Place them exactly where you want them—before you fill them with potting soil and plant. Once they’re full, you won’t want to move them. Plastic pots are cheap, lightweight, and widely available in myriad shapes, colors, and sizes. The main disadvantage of most plastic pots is that the sides heat up too much, and the potting mix dries and pulls away from the sides of the pot. Instead of filtering through the potting mix when you water, the water rushes down through the gap between the potting mix and the pot, and immediately drains out the holes in the bottom of the pot. The roots of the plant are barely moistened. Double-walled plastic pots can reduce this problem. See Troubleshooting for additional fixes. Terra Cotta Pots are classic containers for container gardening. They have a wonderful soft glow in the late afternoon, and radiate warmth at the end of the day when evenings are cool. They’re available in many shapes and sizes, at good prices. Gardeners feel a kinship to these baked earth beauties. But terra cotta pots also have several disadvantages. First, they’re heavy. 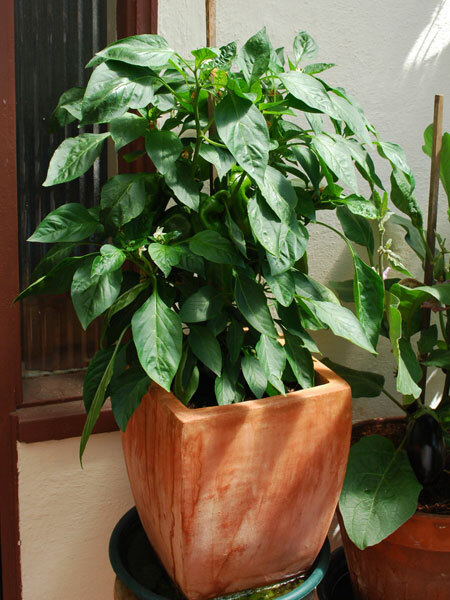 A 5-gallon (27cm) ceramic pot can weigh 30 lbs (14kg), without potting mix or plants. Add wet potting mix and plants, and they can weigh 70-80 lbs (30-36kg). Terra cotta also tends to draw moisture from the potting mix, so more frequent watering is required. Finally, salts may leach through the pots, giving them a white discoloration. In spite of all these issues, I still love them and use them. 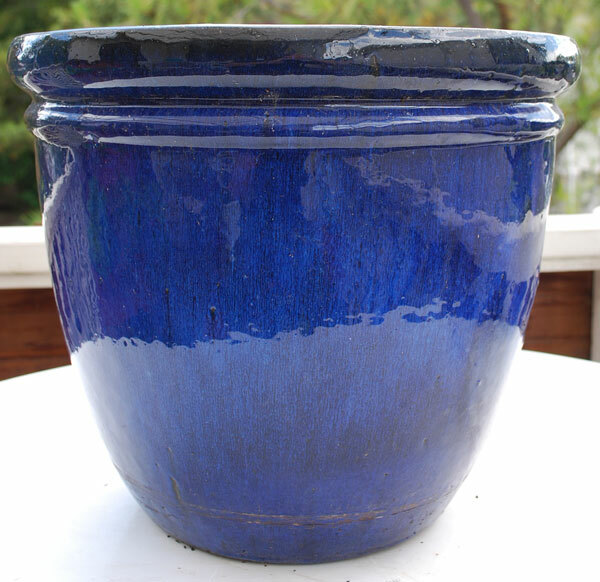 Like terra cotta pots, glazed ceramic pots are heavy, but they’re a better choice for growing vegetables in containers because they don’t wick moisture from the potting mix or become stained by leached salts. Glazed ceramic pots have a much wider color pallet and more visual interest. Cylindrical shape maximizes moist soil volume, minimizes watering. Smart Pots dissipate heat, instead of collecting it. Roots never “cook”. Porous fiber “air-prunes” roots, creating a fibrous root structure that leads to healthier plants than the coiled root structure often found in other pots. Smart Pots don’t need drain rocks in the bottom. They’re lightweight and collapsible—the perfect container for renters and nomadic gardeners. Found and scrounged containers are a good target for urban foragers interested in repurposing urban and suburban waste, as well as growing vegetables in containers. Old wheelbarrows, re-purposed aquariums, wooden wine boxes…almost anything can be made into a container for growing vegetables. Just make sure nothing toxic was stored in it and there’s no peeling paint. Rust is okay. Be sure to drill holes in the bottom for drainage.